WILMINGTON, N.C. — The crew of U.S. Coast Guard Cutter Diligence returned to Wilmington Tuesday following a 62-day patrol in the Eastern Pacific. 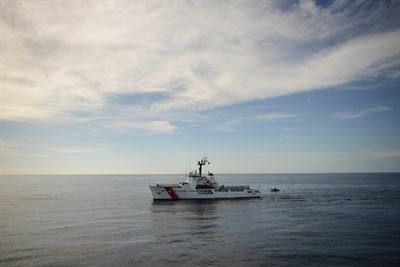 The crew of the Diligence performed a wide range of Coast Guard missions during the patrol, from public affairs in Philadelphia, Pennsylvania, to drug interdiction operations stretching from Mexico to Panama. The Diligence crew patrolled in support of the Joint Interagency Task Force (JIATF) South in the Eastern Pacific as part of Operation Martillo. Along with JIATF South, the U.S. Coast Guard works alongside interagency and international partners to prevent and respond to illegal maritime migration and narcotics smuggling from South and Central America. Law enforcement personnel from Diligence interdicted three high-speed vessels smuggling narcotics and forced one vessel to jettison its contraband before fleeing. Overall, Diligence prevented nearly 2,500 kilograms of cocaine worth more than $60 million from making it to the U.S. When not conducting law enforcement activities, Diligence focused on crew training in damage control, boat operations, engineering casualty control and ship handling to help many new crewmembers complete their required shipboard qualifications. The Diligence crew transited to Philadelphia to provide public outreach. The Independence Seaport Museum has a full-scale waterline model of Schooner Diligence, circa 1797. The model was completed earlier this year and is currently on display in the Patriots & Pirates exhibit. The arrival of Diligence provided an example of service history, and crewmembers gave tours of the ship to approximately 250 people over the weekend. The Diligence is a 210-foot medium endurance cutter homeported in Wilmington, and it’s primary missions include counter drug and migrant interdiction, enforcing federal fishery laws and search and rescue operations.